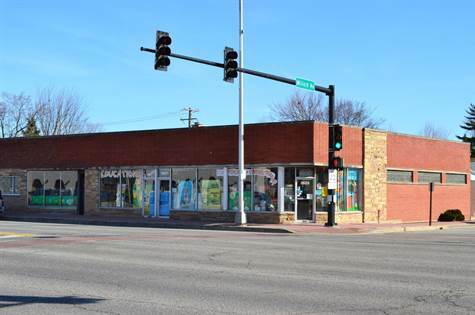 Great visibility location on high traffic 95th Street in Evergreen Park. Located on a stop light corner across from Baracco's Ristorante, Pete's Market and Kenny Bros Funeral Home. 6500 SF of commercial space which includes almost 5000 SF of retail space with 10' ceiling and a 9'x 9' delivery door. Includes about 1700 SF warehouse space with separate heater, 12' ceiling and 10' x 10' drive in door. Retail space has two 5 year old a/c units. Also a 10' x 26' secure storage area at rear adjacent to rear of building. Parking in rear plus street parking on Millard and on 95th Street.